One-stop way to download and convert YouTube online videos to iPad on Mac! mediAvatar YouTube to iPad Converter for Mac makes it possible to put YouTube videos to iPad and play them everywhere on the go even offline. Just a few clicks to download the videos including YouTube HD you like from YouTube to Mac and convert to iPad MP4, H.264, H.264 HD videos and MP3/WAV music. At the same time, this Mac YouTube to iPad Converter allows you to download YouTube videos to Mac without converting to iPad format and convert FLV and MP4 HD videos on Mac computer to iPad compatible files. And the user-friendly interface and designs make you download YouTube videos and manage the downloading and converting jobs very conveniently! The most easy-to-use YouTube to iPad Mac converter ever. Download and convert YouTube to iPad for free watching using mediAvatar YouTube to iPad Converter for Mac! 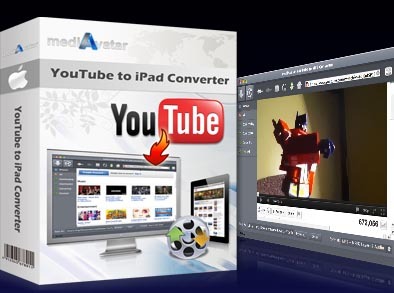 mediAvatar YouTube to iPad Converter for Mac provides one-stop YouTube to iPad downloading + converting solutions. One click to download YouTube to iPad on Mac! You can download videos from YouTube to Mac in many ways using this tool, and you will find it's very easy to download via built-in browser. Besides online YouTube video downloading and converting, you can also convert FLV/MP4 HD videos on your computer to iPad videos or music. You can choose to download YouTube videos in default quality or in HD quality. Easily search, view, and download YouTube videos with Mac YouTube to iPad Converter's built-in browser - the most easy way to browse and download YouTube videos to iPad. Install this YouTube to iPad converter on your PC and you can download any YouTube video by right-clicking on its URL and selecting the download option in right menu. Start, pause, delete, and remove the downloading/converting jobs freely. Set the Proxy Server and download YouTube videos via Proxy if your network doesn't allows you to access YouTube website. Set the destination file folder, max downloading speed, max simultaneous conversions/downloads tasks, default resolutions of the YouTube downloading, and so on. For Mac users to download online videos to iPad; convert videos, audios to iPad; backup iPad to Mac/iTunes; create iPhone ringtones.